The first game of the Mens Futsal Oz Cup, pitted Hume against Fitzroy as both sides looked to progress to the semi finals. It did not take long for Hume to open the scoring as Moe Matar turned inside and struck it through two players legs to give his side the lead. Ubeyde Cicek would then double the advantage as he lashed home an effort from a corner. Fitzroy had a very young side in for this one, but the youngsters combined to halve the deficit as Harry Robotis found Elias Parthimos at the back post who finished it off. Soon after Fitzroy were level as Scott Rogan touched it around Omid Abdollahi to level proceedings. Hume would again find themselves ahead as Matar struck again with a toe poke high into the net as Hume held a 3-2 lead at half time. Early in the second half Hume added to their lead as a good turn from Cicek saw him toe poke a low effort home to give his side some breathing space. With time running out Hume had all but sealed it as Cicek struck his hat trick from the sideline to make it 5-2. Fitzroy turned to the fifth man tactic and pulled one back as Harry Robotis rounded up the keeper and scored but Fitzroy would fall short as Hume took the victory and progressed to the semi finals where they face Carlton Heart. The second of the quarter finals saw Pascoe Vale face old rivals and State League Champions Moreland. It was the Blues who opened the scoring as a long range effort from Adam Cooper was turned in by Jason Barrientos to give his side the lead. Pascoe Vale soon hit back as Joao Da Silva finished from a side ball high into the net to level proceedings. Moreland would then take the lead soon after as a Cooper free kick was deflected in by Joao Da Silva for an own goal to give Moreland a slender 2-1 lead at the half time break. Early in the second half Moreland extended their lead as Matthew Vragkovski rounded up the keeper and finished to give his side some breathing space. A counter attack from Pascoe Vale soon after saw Alisson Lima touch the ball past the keeper and have his side within a goal, before Kui Mu dragged back his defender and was shown a straight red card. In the final seconds of being down a player Pascoe drew level as Alisson finished off another chance to level proceedings at 3-3. A fantastic turn from Jake Besenyi saw him find himself one on one before finishing to give Pascoe Vale the lead. Another fantastic turn again for Pascoe Vale this time by Behrad Behzadpour finishing off the move with a yepa doopa and his first Pascoe Vale goal opening up a two goal cushion. the game was all but over as Alisson came inside and banged home his hat trick on his left foot for a 6-3 lead. Josh Allen would finish a chance from the left hand side to keep his side in with a chance. It was game over though as Moreland turned to the fifth man tactic which gifted Joao Da Silva a second of the game floating into an empty net and booking their place in the semi final where they’ll meet Western Wolves. The first of the semi finals saw league champions Carlton Heart take on Hume in what is always a close affair. It was the Heart who opened the scoring as Ernie Simsek was played through on goal and slotted it through the legs for the opener. Atay Ibrahim would then toe poke home from range to double the advantage. Soon after Simsek turned provider as he cut it back to Abdirahrman Ahmed who tapped home for a 3-0 lead. Hume pulled one back through Ubeyde Cicek who hit a venomous toe poke home to get a goal back. A throw in was turned into the area for Ali Al Sharani to convert and give Carlton a 4-1 half time lead. Hume came out of the half time break on the front foot and pulled a goal back as Cicek found Nejdett Sahin at the back post who tapped one home to keep his side in the game. Cicek then got himself another goal converting a free kick through the legs of Peter Tamburrio, and shortly after they were level as Nejdett Sahin struck a thunderbolt from range to level proceedings at four. Hume then took the lead as Hanna Shamon struck from range with Hume close to pulling off a big victory. With time running out Atay Ibrahim sent the game into extra time as he struck a low ball which found its way in under Ozkoca levelling the scores at five. In the first half of extra time Carlton regained the lead through another Ernie Simsek goal which gave them a slender lead early in extra time. Hume then conceded a ten meter penalty in the second half of extra time which Simsek stepped up and converted to all but seal the win, before Hume conceded another ten meter penalty which Simsek converted to put his side into the final where they meet the winner of Western Wolves & Pascoe Vale. Next up we saw Western Wolves face Pascoe Vale in what was a cracking game on paper. Pascoe would draw first blood as the initial shot was saved before Behrad Behzadpour finished up at the second attempt to open the scoring. Rico Hauser then hit a rocket of a free kick to double the advantage, before Alisson Lima found the near post gaping to make it 3-0. Joao Da Silva cut inside onto his left foot before finding the bottom corner to make it four as Pascoe were running riot. A good tactical time out called by the Wolves and they struck straight after as Ahmed Azzam found a gap in the wall and struck to keep them in it. A penalty was then awarded to Pascoe Vale, which Joao Da Silva converted having the Lions leading 5-1 at the break. Wolves came out of the blocks firing in the second half as some lovely play saw Elvis Kamsoba tap home at the back post to pull a goal back, before Alisson struck at the other end to again stretch the deficit. Kamsoba would find the net for a second time to bring it back to three goals the difference, but Behzadpour would all but end the Wolves hopes as he finished another before Jake Besenyi hit an open net during the Wolves fifth man to make it 8-3. A lovely ball from Nathan Long found Azzam at the back post to tap in a late consolation but it was no more than that as Pascoe Vale progress to the final where they face Carlton Heart. Only two stood with a chance to take home the Futsal Oz Cup and it was league Champions Carlton who faced Pascoe Vale. It was the Heart who opened the scoring as Abdirizak Ahmed turned well as a target and finished on his left foot to open the scoring. Pascoe Vale would hit back from a well played side ball from Rico Hauser who struck it over the head of Peter Tamburrino to level proceedings. Carlton again regained the lead as Abdirizak Ahmed converted a header from a throw in, before Arturo Diaz was afforded too much time and space before hitting a stunning toe poke off the post and in to open up a two goal cushion. Late in the half Behrad Behazadpour would finish a stunning effort while he lay on the floor to have the Lions within one goal at the break. Early in the second half Carlton again restored their two goal advantage through a stunning chip from Abdirizak Ahmed which completed his hat trick before some quality play from the Heart left Abdirizak Ahmed with a tap in to get his fourth and open up a 5-2 lead. A cracking karate kick from Ali Al Sharani made it 6-2 before, a fantastic run from Peter Tamburrino saw the Heart stopper tap home at the back post to seal another piece of silverware for Carlton Heart defeating a galant Pascoe Vale. In amongst the Mens Futsal Oz Cup, we saw the Under 16’s grand final take place as league champions Fitzroy took on second placed Regent City. Regent hadn’t beaten Fitzroy all season but they got off to the perfect start with Ali Atosh finishing his chance to make it one-nil. The Tigers would level it up thanks to Abed Chandab who finished on the counter attack, before some lovely play from Fitzroy saw Harry Robotis find Arjun Cappello who made no mistake with the finish to have Fitzroy leading 2-1 at the break. Fitzroy would open the second half with another goal this time Hamza Soueid left with a simple tap in after some great build up play. Regent were hanging in the contest and got a goal back as Shuayb Abdulkadir cut inside and finished from range. 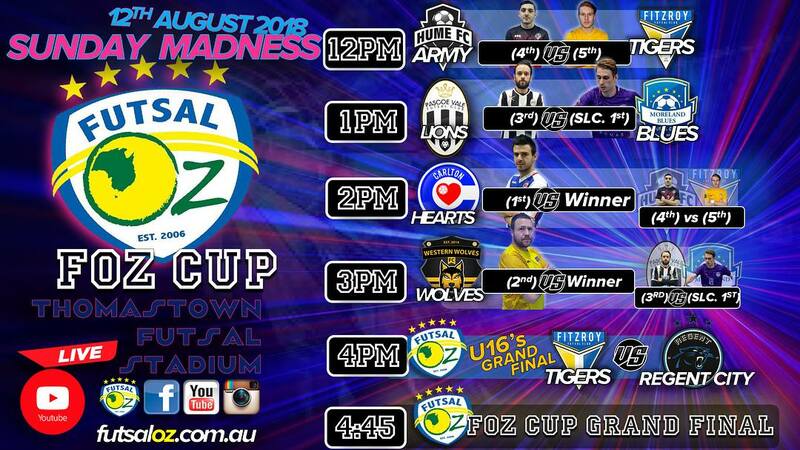 It looked all but over though when Elias Parthimos finished from a tight angle to make it 4-2, before a thumping strike from Harry Robotis found the top corner to add some polish to the result, and Soueid added another late on which clinched the golden boot for himself and sealed back to back Under 16’s Futsal Oz Cups for the Tigers.